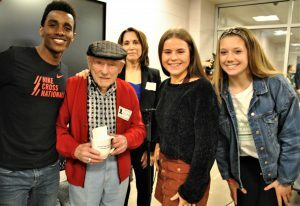 Arthur Weisfeld, a Polish-American Holocaust survivor, sat down with students in the Leadership Academy course to tell his remarkable story of endurance and memorialize his family members who did not survive Hitler’s persecution of the Jewish people. 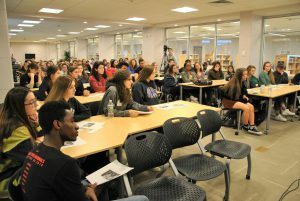 They gathered in the High School Media Center on Tuesday, April 2, joined by teacher Eugene Burns, school administrators, and district officials. 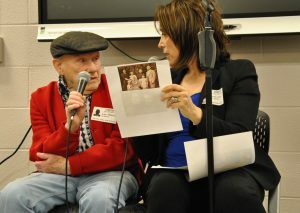 Dr. Leslie Green of the Jewish Federation and Family Services of Orange County (JFFS) introduced Mr. Weisfield and provided the historical context for the night his parents and younger sisters were carried away by Nazi forces, never to be seen again. Ages 12 and 14, Mr. Weisfeld and his older brother were trucked to the first of several concentration camps and eventually separated. Mr. Weisfeld would learn of his brother’s death when, sorting through the clothes of murdered prisoners, he came across his mother’s coat. She had given it to his brother before being taken away by the SS. 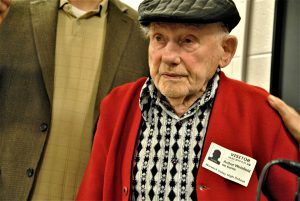 Mr. Weisfeld offered detailed and dramatic accounts of life and death in the Nazi concentration camps, his experience through a “death march,” and the day General Patton’s army liberated him and his fellow prisoners. It was the dream of that day that kept him fighting for his survival. “I just wanted to live long enough to see the Germans lose the war,” Mr. Weisfeld said. Mr. Weisfeld would go on to cross the Atlantic and serve in the intelligence services of the United States Army. Mr. Weisfeld also paid tribute to the people who helped him and others survive and endure, including German fellow-prisoners who had refused to join Hitler’s army or adopt his ideology. 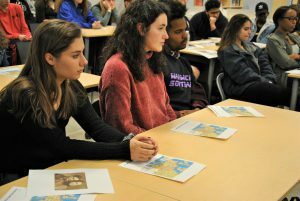 “I thought the presentation was very interesting and gave a first-hand account to an event that I would have only ever read about,” said Owen Harrison, a junior. Following the presentation, students had the opportunity to ask questions of their special visitor and celebrated him as a hero posing for selfies and group photos. “He gave insight into his amazing life which showed us the struggle and hardships he had to overcome to survive,” said junior Gabe Rodriguez, one of the students who insisted on a selfie with Mr. Weisfeld. This special event was made possible by the Zacho Fund of the Jewish Federation and Family Services of Orange County.